A while ago, a runner (and all round awesome person) I know was telling me about how much she loved her running commute. I nodded along, smiling at the thought of it, feeling slightly awestruck at the mental distance she was regularly covering (10 miles! ), but never thinking it was something I would add into my routine. It was too difficult to organise, too hard for me to work out how to get kit to and from work, and too hard for me to downscale all that tat I shove into my bike pannier and take with me to work every day. I’m not even sure how it started. I know one day back in March my friend Pete decided to run from Cambridge to Waterbeach, which is around 10k along the river. He did it, and I happened to bump into him as he was jogging back home. He was full of the joys of his run, if feeling a little foolish at deciding to stick both a coat and an umbrella in his rucksack. I guess you never know right? I started thinking seriously about giving it a go, chatting to some runners on Twitter, and seeing just how many people love choosing running as part of their commute to or from work. So I decided to get myself a running backpack (this Deuter Speed Lite was a steal back in April for £25), and managed to learn to pack light. For anyone who knows me well, this is nothing short of a miracle. I swapped my journey to work, leaving my bike at Ely station and walking the 1.3 miles to work from Cambridge station in my running gear, changing into my carefully chosen lightweight work outfit when I reached the office. At the end of the day, I then jogged half a mile to meet Pete outside the Scott Polar Research Institute and off we went, running a mile through the city until we hit the river path. And blooming heck what a gorgeous run it is. It’s so easy to follow, nice and flat, not super busy with people (so long as you avoid The Bumps!) and flipping full of nature. On our first run together we saw herons, swans and deer. We time it so that there are two trains we can catch from Waterbeach 15 minutes apart (so if you miss the first train on the old cold day you don’t freeze waiting on a platform for ages as your sweat dries – attractive I know). We’ve only had one really buggy day (a miracle when you’re running alongside water) when we both landed beasties in the eyes, but that’s such a small issue to deal with. The best bit of all is that we’re both feeling faster when we run without rucksacks. I’m not sure if we actually are, but there’s a lot to be said about the mental boost of feeling like you’re flying just a little bit faster than normal. The only problem now is I’m not sure what I’ll do when winter rolls back in. I know it’s ages off now, but the riverside isn’t lit at all, so running home after work simply won’t be an option. The only choice would be to switch the commute from evening to morning, and as someone who isn’t a morning person OR a morning exerciser, this doesn’t exactly appeal. I know you’ve all watched it by now. Or if you’re like me, you’ve watched it about 40 times. The moment Swansea Harriers’ Matt Rees stopped 200m from the end of the London Marathon to help David Wyeth from Chorlton Runners reach the finish line. David’s legs had gone to jelly, his body having run out of carbohydrate stores and he was in danger of not making it. He was agonisingly close to the finish line, waving past runners who were slowing down to check on him and claiming that he was ok. But Matt knew fully well that he wasn’t, and chucking his own time out of the window he helped get David to the finish. Twitter went bonkers, and rightfully so. The London Marathon has the ability to bring grown adults to tears as they sit on the sofa, drinking tea and eating mint Oreos (just me?) whilst marvelling at people putting themselves through the most mentally tough thing some of them will ever do. Let’s face it, the world is a bit of a “funny” place right about now, and sometimes we all need to have our faith in humankind rekindled, and watching the way people help and support each other in feats of physical endurance (let’s not forget Alistair Brownlee helping Jonny across the finish line in the Triathlon World Series in Mexico – and letting him cross the line first no less) is a sure fire way to melt even the iciest of hearts. But it doesn’t just happen on the world stage. At the 1st Kevin Henry League race of the season last week, I found myself struggling with about 1.5k to go. I wasn’t going easy on myself, and I was pretty cold after getting caught in a hailstorm on the way to the race. I also had a few people overtake me (including some ridiculously chirpy folk, Andrew and Lauren, I’m talking about you! ), which doesn’t happen that often and made me panic that I had gone off too fast. At the 4k mark I knew I was going to make it to the finish ok, but I knew it was going to be ugly – when my breathing starts sounding like a dog who has inhaled a broken harmonica I know I’m in trouble. But then I realised that I was running side by side with a Haverhill Runner, and by some miracle I was managing to match my pace to his. I swore like an absolute trouper (but I did apologise after every verbal bomb, honest) and somehow this lovely man kept me going, offering encouragement and saying things like “come on, only 400m to go”. And then to top it all off, he let me cross the line first. What a blooming legend. There I was thinking he had dragged me round, when really we had dragged each other round, and he got a PB to boot. We’re running for different clubs but we just desperately wanted to get each other across that finish line in one piece. I’ve since chatted to Neil on Facebook, and I’ve no doubt we’ll be running together again and who knows? Maybe we’ll both get a PB this season (but if we don’t, that’s ok too)! I love running for so many reasons, but the bond it can create between complete strangers is just awesome. Regular readers of this blog will know that 2016 was a tough running year for me. 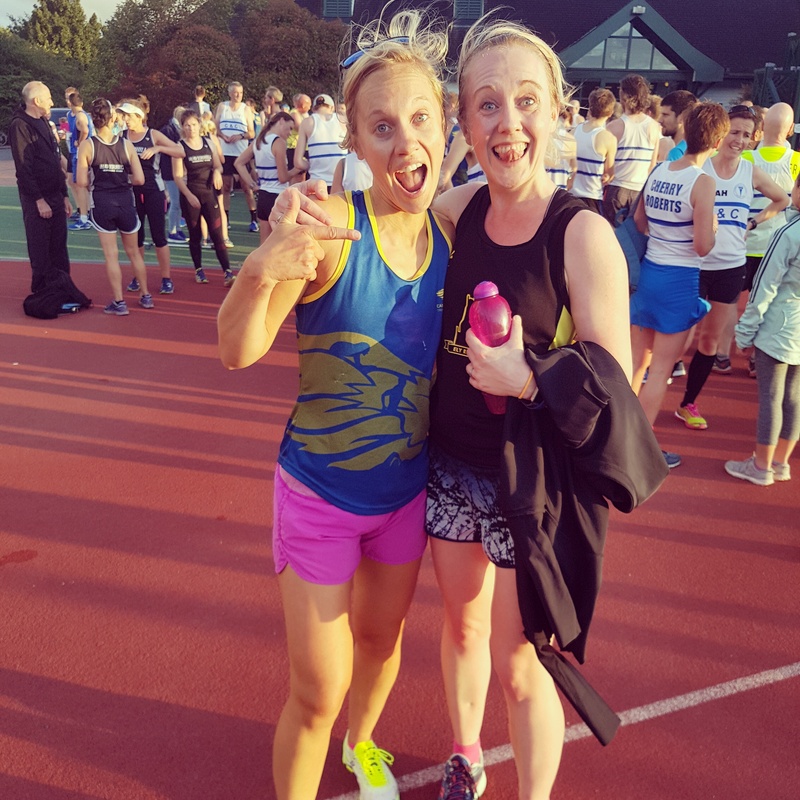 I had so many injury niggles over the year, and my anxiety around my running got so bad that I had to step back from races and even longer runs because my IBS flare ups were making it impossible to run. But then towards the end of last year, a friend reached out with the idea of an experiment of sorts, after reading my blog post about my IBS. This friend is an acupuncturist in Ely, and we know each other through a mutual friend. We actually ran Insane Terrain as part of a team of 4 back in 2014. So, he offered to give me a few free sessions of acupuncture, and if they went well I could tell you guys about it, and if they didn’t help me, we could just part ways and continue to meet up at the odd get together. Now I’ve always been pretty open to the idea of “alternative therapies” (the category that acupuncture tends to get lumped into) so I was more than happy to give it a go. After an introduction session where Anthony spent about an hour learning about my medical background (reasonably complex) and commenting on my “slippery” pulse (that didn’t sound like a compliment), I then had a cluster of treatments over a 6 week period, before moving to a treatment every 4-6 weeks. Insane Terrain. Yes those shorts were odd. The good thing about Anthony is that although he is incredibly knowledgeable about what he does, he is in no way preachy about it, something I would struggle to get on board with. Instead he just drops into the conversation the fact that I have too much “Yang” (always go, go, go for me) in between the two of us putting the world to rights discussing everything from politics to reality TV. He is incredibly easy to talk to and is also a huge advocate of discussing the importance of mental health, a cause close to my heart (he highly recommends the Headspace app and is the brains behind Talking FreELY, a new Mental Health Awareness group in Ely). All of these things make a great practitioner. As for the treatment itself, I do get a load of needles put into me (I think the most was maybe about 25) but they don’t hurt. Sometimes they cause a pins and needles sensation but it’s never uncomfortable. Anthony also uses moxa, a herb which he lights and allows to smoulder on my back which is then removed as soon as I start to feel the heat. It’s used to impact on the flow of “qi” in the area being treated, and I am obsessed with the smokey aroma it gives off. A nice side effect. He also often places ear seeds on my ear on trigger points where I can press on them whenever I feel my anxiety building. But I guess the question is, did acupuncture work for me? My IBS issues during training all but disappeared (apart from when I failed to avoid triggers, such as episodes of unusually high stress or a super strong coffee less than 2 hours before a 10 mile run – idiotic) and my general demeanour around races has been a lot calmer. But the real test was always going to be the Cambridge Half Marathon. A race with a capacity of 9000 runners is huge for me. I hate being in large crowds, and in previous years I would be unbearable to be around from about 2 weeks before the race. Usually I would be maybe 15% excited and 85% nervous about a race like this, but this year it was easily the other way around. I also planned my morning pretty carefully, hanging out at my sister’s until about 10 past 9, before running/jogging to Jesus Green, using the completely empty public toilets there (perhaps I shouldn’t be letting you lot in on this tip!) and then simply hopping the gate into my starting pen 4 minutes before the race was due to start. I avoided all of those stress triggers, and went on to do the race of my life. I firmly believe that the treatment Anthony has done on me has played a huge part in my running epiphany, and I’ve been a (paying) customer of his since the start of the year, and will continue to be from now on. My December 2016 Round Up – Three Very Different Races! In the lead up to Christmas 2016 (how long ago does that feel now?) I was involved in three very different races, the first of which was the Arthur Rank Hospice Festive 5k in Ely on November 20th. This event is such a blast and sells out every year. It goes around the main city centre of Ely, ending with a blighter of a climb through Cherry Hill Park (thanks for lurking there Mr Photographer) and finishing on the market square. This was the third year running that I’ve done this race. On my first attempt I somehow managed to be first woman in a time of 22:04 (it was really wet which I think kept the speedsters at home) and in 2015 the fastest woman smashed it in 19:45 (I did 20:37). As for 2016, it had been a long year, and I just didn’t fancy a hard run. I wanted to have fun, and this is an event known for runners in fancy dress (there’s a prize each year for best dressed) and luckily for me, Running Buddy Extraordinaire Pete decided he just wanted a laugh as well, after a hard racing year where he smashed pretty much all of his PBs. So, we did what any sane people would do and dressed up. As Christmas trees. Complete with fairy lights. I was up to my eyeballs with a cold as well, and as my battery pack for my lights lodged itself in a really unhelpful position down the back of my shorts, I knew I was in for an uncomfortable run. The stitch hit in pretty quickly as I found myself unable to get my breathing into a decent rhythm, and Pete basically had to talk me through the damp 3 miles as I whinged my way round Ely. We finished in 22:41, and once I got home I found out that by some miracle I had been the fastest woman again. Arthur Rank accidentally gave the prize to another woman who crossed the line first but had actually been 4 seconds slower than me across the course, but to their credit they apologised for the mistake, sent me a prize in the post and told me that they are going to have plans in place to make sure it doesn’t happen again next year. This race is probably the loveliest one of the year. The support from the folk of Ely is awesome, the marshals are the BEST at cheering you on and it’s just such fun. Plus it’s all for a brilliant cause. Keep an eye on their website – they’re adding to their running events calendar all the time. Then on the 18th December, I found myself on a coach at about 8am, ready to be driven out into the countryside just so I could run home again. Sometimes I think past Lauren would be so flipping confused. I had signed up for the Ely Runners Christmas run again, a social, untimed, cross country run. Last year I did the 7.5 mile leg and this year I signed up for 12.5 miles (the next option being 18.5). As per usual Pete was along for the ride, and complete with festive headgear, we set off from Woodditton at 9am, and precisely 60 seconds later our trainers were caked with mud and three times as heavy. Awesome. The first 7.5 miles actually went better than expected. We were prepared for the very rural route after last year, we sang along to Christmas tunes that Pete played on his phone (thankfully we were pretty much running alone), and I got about 6 miles in before tripping and doing an epic combat role stopped only by my face (thankfully the fall looked more impressive than it was). It was ironically when we stopped at the first refuel station that I started to struggle. We just stopped for a little too long (mostly gawping at Stephen’s impressive cut on his leg which put my scratches to shame) and it turns out that eating something mid-run really doesn’t work for me. So we ended up run/walking the last 5 miles, partly due to not knowing where we were going and the terrain, but mostly due to my running out of steam. I really enjoyed the run, even though our glorious sprint finish was scuppered by the terrain resembling the bog of eternal stench. I’m definitely going to do it again next year, and who knows? Maybe I’ll attempt the full 18 miles! The Bog of Eternal Stench. If you didn’t know this, FOR SHAME. The last race wasn’t one that I ran. Instead, I was marshalling. Every year the Ely Runners host the NYE10k, and every year it sells out within about 24 hours. I didn’t know where I would be for NYE, so I didn’t sign up. But to be honest, this was a handy excuse. Because the truth is, I kind of hate the route. It’s exposed and a bit dull, (read: tough) and we have to run it for our 10k handicap. Once a year is enough for me. It was so much fun to be able to enjoy the race from the other side (although my step count suggested that running it would have been the easier option). Watching our Race Director Charlotte run the whole thing like an epically well oiled machine was incredible, and cheering the runners over the finish line was an absolute blast. Everyone seemed to have had such a great time, and there is something special about ending your year with a race. And having an excuse to wear an awesome wig was the icing on the cake (even if it was a bit small for my weirdly massive head). So those were the races I ended a very odd 2016 on. And wouldn’t you know it? I’ve blogged in January with 6 minutes to spare. Hang on 2017 – my blog and I are coming for you.